Many of you know Anthony Hamilton for his love songs, ballads, and soul-stirring music. But if you've followed his career since the early days, you'll recall that in addition to being nominated for Grammys, going platinum, and selling out concerts, he's always been a sought-after hook singer. And by that, I mean singing the choruses on rap songs. In fact, his first hit song was the 2002 collaboration with Nappy Roots on the rap song "Po' Folks." Two years later, he assisted Jadakiss on one of the biggest songs of The LOX member's career, "Why." The rap collaborations have continued over the years, with A-Ham singing hooks for everyone from Common to Nas to Twista to Young Jeezy. For his latest collaboration, he brings it home to his native Charlotte, with Ed D. Kane, an artist on Anthony's own label, Mister's Music. The song is titled "Da Streets" and the video was released a few days ago. Charlotteans Ed D. Kane and Anthony Hamilton. 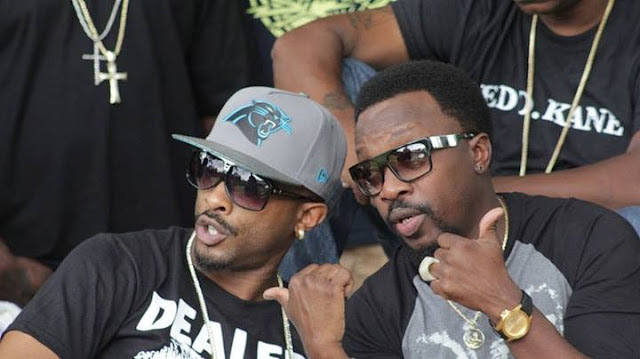 The video was shot in "da streets" of Charlotte, literally, featuring gritty scenes paired with news footage of controversial national stories and civil rights issues. The visuals are to match the song's message, and you could say that it follows in the vein of the aforementioned "Po' Folks" and "Why." Unfortunately, "Da Streets" falls short in its efforts. Ed D. Kane's lyrics aren't strong enough in this song, and his profanity is a distraction. I applaud when rappers add substance to their music, but this song isn't quite "conscious" music because his attempt to bring attention to issues like drugs and violence could be confused with glorifying them. However, I do like when Ed D. Kane says, "You know you know better. Done been selling crack out your mama's house." Anthony nails the hook, as usual. And it's good to see him continuing to rep his old hood--Beatties Ford Road, West Charlotte. I'm sure the locals surrounding him in the video appreciate the love.